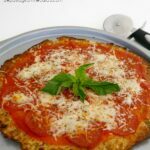 This cauliflower pizza base is healthy, tasty, and of course – low carb! 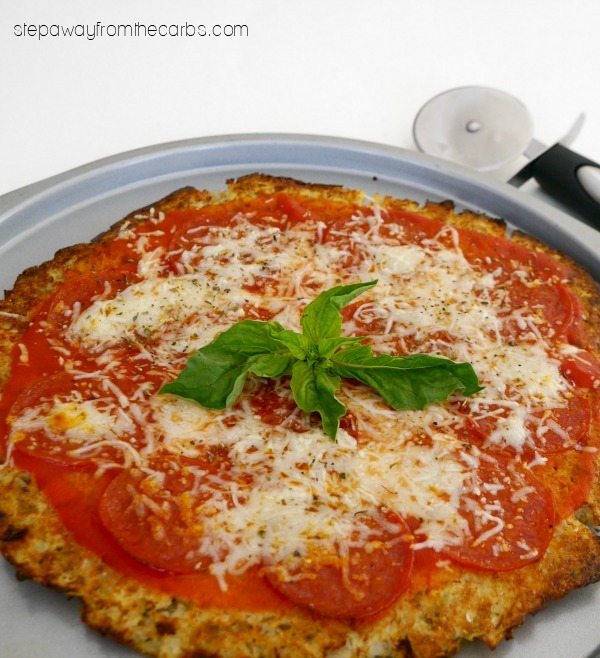 Making low carb pizza bases from cauliflower isn’t exactly a new concept. BUT – I’ve never tried it. And if I’ve never tried it, then there’s a chance that you might not have done either! The process is a made a lot easier by the fact that some grocery stores are now stocking ready-riced cauliflower – or “Cauliflower Crumbles” as I think one company calls it. I’ve seen them in Target and Walmart and it certain speeds up the recipe! To start, cook the cauliflower. Steaming it in the microwave is preferable to boiling because then it just gets soft, not soggy. When it is super tender, carefully empty it into a large bowl and let cool a little. To the bowl add an egg white, flaxseed meal, shredded cheese (I use an Italian blend), onion powder, dried oregano, salt and pepper. Mash it all together until it is smooth and well mixed. 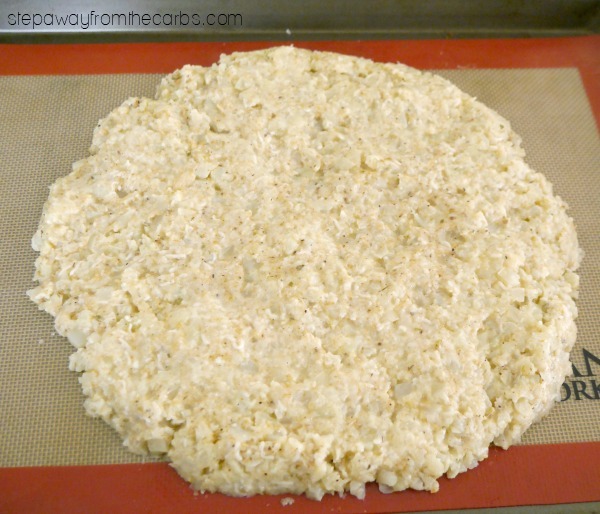 Line a baking pan with a silicone mat and spread the cauliflower mixture onto the mat. Push it into an even circle shape. Place in a preheated oven for around 15 minutes. 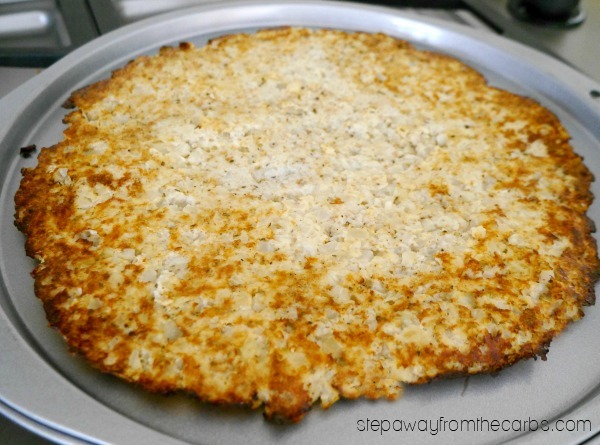 Invert a nonstick pizza pan over the top of the cauliflower, then flip everything onto the pizza pan. If you have pizza pan with ventilation holes that would be the best choice, as it will help crisp up the base. If you don’t have a pizza pan then just use any nonstick baking pan. Place the pizza base back in the oven for 5 minutes. Then you are ready to add the toppings! For this pizza I added a simple tomato sauce, cheese, pepperoni and Italian seasoning, then gave it another few minutes in the oven to melt the cheese. Cook the cauliflower until very tender. Transfer to a bowl and leave to cool. Spoon the mixture onto a baking pan lined with a silicone mat. Press it into an even circle. Bake for 15 minutes. Invert a pizza pan over the top, then flip the pizza base onto the pizza pan. Bake for another 5 minutes. 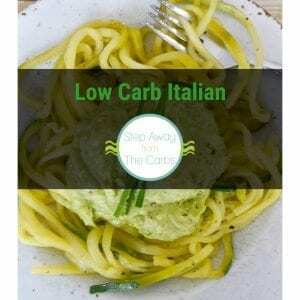 Add the desired toppings (not included in nutritional data) and cook as needed. When you say ‘finely chopped’ do you mean ready riced? Does the end product taste of cauliflower? The finished pizza isn’t very cauliflowery, actually! You could whizz some cauliflower up in the food processor if you can’t buy it ready chopped.